An important note before you continue: If you are planning on removing the nozzle you must first get in contact with us for warranty purposes. First it should be noted that the nozzle of the UM2 is integrated into the heater block and the two can not be separated. 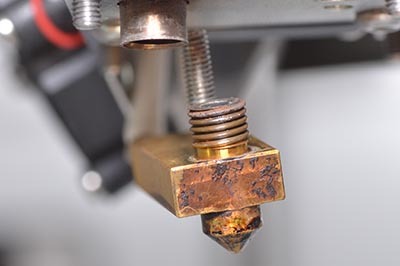 This is different from the Ultimaker Original where the nozzle is a separate piece that you can easily remove by heating the print head to printing temperature and simply unscrewing it with a wrench of other suitable tool. For simplicity we will refer to the nozzle+heater block combination of the UM2 as "nozzle" in this guide. 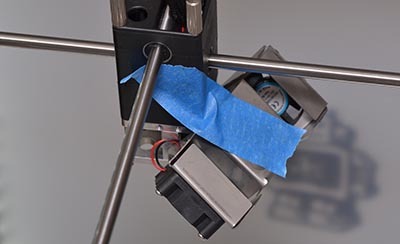 First remove the filament and then start by removing the fan shroud by unscrewing the four screws that hold it in place. There are two screws on each side. Be ready to catch those little buggers as they have a tendency to bounce around and get lost if you drop them. Once the screws are removed you can slide the fan shroud off the head. Use a piece of tape to keep it out of the way. If your printer is turned on, be careful that you don't poke something into the third fan on the head. Taping the shroud out of the way is optional but it does help. 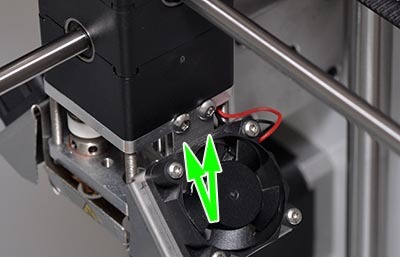 You can now start to unscrew the nozzle by inserting a small screwdriver into one of the holes in the ring indicated below and turning anti-clockwise. Be careful here and only use moderate force. If it does not move it means that there is plastic in the threads keeping the ring in place. You will have to heat up the print head to soften the plastic, around 100C will likely do the trick. Once heated it should be fairly easy to rotate the ring. Keep turning the ring until the nozzle drops out. 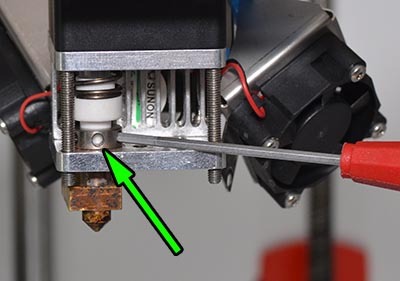 Remember that the nozzle is very hot so make sure you don't try to catch it or allow it to touch any of the plastic parts of the print head. You might notice some brown residue that looks almost like rust underneath this ring. Don't worry, it is not rust but copper grease that was put there intentionally. You will now have access to the screw that locks the heater cartridge and temperature sensor in place. Use one of the allen keys that were supplied with your printer to unscrew it. 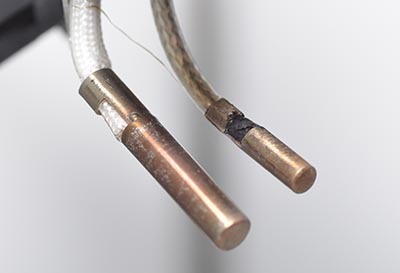 Be careful when removing the heater and sensor as it is easy to break the wires if you use too much force. If they wont budge you can try turning up the heat. The thermal expansion of the parts should help you get the parts loose. The larger part on the left is the heater cartridge. To re-assemble, simply reverse the steps above. 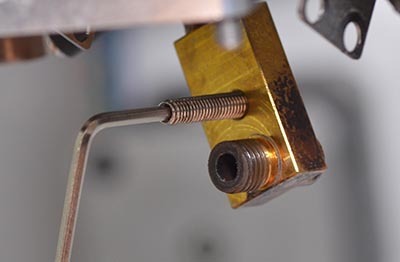 Be careful when tightening the set screw, it should be snug enough to prevent the heater and sensor from moving, but don't over tighten as you might damage them.